Many tissular functions rely on the properties of the extracellular matrix, which depend on the molecular composition (types and proportions). This is true for both plant and animal tissues. The extracellular matrix of plants is known as cell wall. Here, we are going to include the cell wall as a type of extracellular matrix, although animal and plant cell extracellular matrices are really different. Plant cells can not be understood without the cell wall, which is a distinct feature when compared with animal cells. Cell wall provides structural support and protection to plant cells, and therefore to the entire plant body. It also determines the shape and size of the cells and is responsible for tissue features like resistance to mechanical forces, both loads and stretching. The aerial parts of plants are possible because of the plant cell. The supporting role of cell wall in the plant body continues even after cells die. For example, wood is mostly cell walls. The most prominent component of cell wall is cellulose, which is the most abundant molecule in nature. Depending on the plant tissue and differentiation state of the cell, cell wall may show different molecular composition. Figure 1. Cell wall layers during secondary grow. The thickness of the cell wall depends on the type and age of the cell. Up to 3 layers can be found: middle lamella, primary cell wall, and secondary cell wall (Figure 1). Cells synthesize these layers starting with middle lamella, then primary cell wall, and finally secondary cell wall, which is not always present. The most recent layer is the nearest to the plasma membrane. 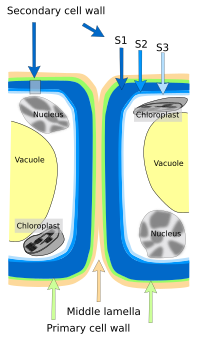 All plant cells have a middle lamella, which is shared with the neighboring cells, and a primary cell wall with variable thickness, but only some cells develop secondary cell wall. Primary cell wall allows cell to grow in size because it can be stretched by hydrostatic pressure, which is referred as turgency. Secondary cell wall is synthesized by cells that withstand heavy mechanical loads and by some vascular cells. Secondary cell wall may be divided in sublayers (S1, S2 and S3). The synthesis of secondary cell wall usually means that cell is not going to grow anymore, because cell elongation is not possible. Secondary wall is no permeable to water but there are many pores (pits) that allow water to cross the secondary cell walls of adjoining cells. Figure 2. 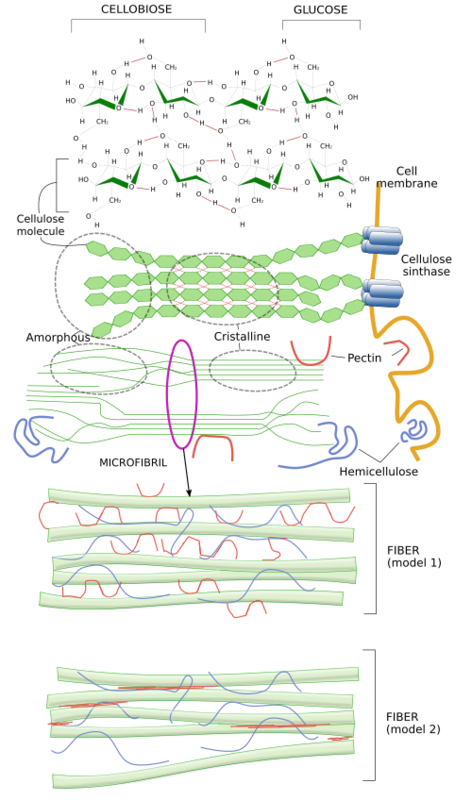 Organization of cellulose fibers in the cell wall. Three polysaccharides are the main components of the cell wall: cellulose, hemicellulose and pectin. There are also proteins and other chemical substances (Figure 2). Cellulose is the main component of the cell wall. It is a polysaccharide made up of D-glucose, linked together by β (1-4) bonds. 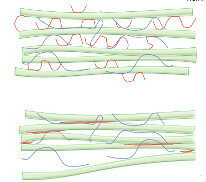 Long chains of D-glucose are parallel-oriented and joined together to form cellulose microfibrils with variable diameters, which in turn associate together to form cellulose fibers. These fibers are visible at light microscopy and are very resistant to mechanical stress, similar to steel. Cellulose fibers also contain other saccharides like hemicellulose and pectin, as well as glycoproteins. Hemicellulose is a family of polysaccharides containing xylose, glucose and mannose, which make cross-bridge bonds with cellulose microfibrils, strengthening the network of cellulose fibers. Pectins are the more diverse type of polysaccharides that can be found in primary cell wall, but they are absent from secondary cell wall. They are heterogeneous polysaccharides, contain galacturonic acid, and make cross-bridge links between cellulose microfibrils. Pectins are highly hydrophilic molecules. Other molecules can be found in particular cell types. Calose is a polysaccharide located between the cell membrane and cellulosic part of the cell wall. Lignin is a polyphenolic polymer released into the cell wall after the secondary cell wall synthesis that restrict the water diffusion and provides a great mechanical strength. The cell wall of some cells, like epidermal cells, shows cutin and suberin, which are lipid depots preventing water lost and the entrance of pathogens. Enzymes can also be found in the cell wall contributing to cell wall remodeling. Glycoproteins are involved int the molecular network that provides structural stability of the cell wall. Basal lamina is a thin layer of extracellular matrix located at the basal part of epithelia, and around muscle cells and nerve cells of the peripheral nervous system. It works as a physical support and as a selectively permeable barrier. For example, in kidney glomeruli, it is a key player in filtering the blood. Basal lamina is composed of molecules arranged in an ordered 3D network. It contains type IV collagen, laminin, perlecan proteoglycan, nidogen protein, and some more. Basal lamina is linked to the membrane of the basal domain of epithelial cells by connections between integrins and laminins. Extracellular matrix of loose connective proper tossue shows low protein density, with higher proportion of hyaluronan and proteoglycans than collagen and elastic fibers. The main role of this extracellular matrix is to fill and hydrate intercellular spaces and provide the environment through which many cells travel from one site to another. However, in the dense connective tissue there are many collagen fibers, either arranged parallel to the tensile forces, such as in tendons, or disorganized as in the dermis or in the intestine. Elastic fibers may be abundant, as in the artery wall. Tendon clearly shows that withstanding and elasticity of tissues depend on the features of the extracellular matrix. Collagen fibers of tendon are oriented parallel to the direction of the mechanical stress, which is only in one axis. The extracellular matrix is rich in collagen fibers and fibroblasts. Collagen is up to 65-80 % of the dry weight of the extracellular matrix, whereas elastin is only 1-2 %. Cartilage extracellular matrix is synthesized by chondrocytes, and is responsible for both stiffness and elasticity of cartilage. It is mainly composed of type II collagen, up to 25 % of dry weight, but types IX and XI collagens are also present in lower proportion. The second most abundant molecules are glycosaminoglycans, such as hyaluronan and aggrecan, which join together to form macromolecular complexes. Collagen counteracts tensile loads and glycosaminoglycans dampen mechanical pressures. Elastic cartilage contains abundant elastic fibers, which are necessary for the elasticity of structures like pharynx, epiglottis, and pinna. Bone extracellular matrix contains type I collagen intermingled with a matrix of calcium phosphate crystal (which is up to 70 % of the dry weight). Collagen allows bone to be elastic enough to avoid bone fragility and not to be easily broken, and calcium phosphate crystal provides stiffness and hardness. There are also proteoglycans and glycoproteins, which are less abundant, but very important for the organization of collagen fibers, mineralization and resorption of bone. Chondroitin sulfate accounts for 67-97 % of the bone glycosaminoglycans. There is little amount of extracellular matrix in the nervous tissue. Hyaluronic acid and proteoglycans are more abundant than collagen, elastin and glycoproteins. During development, nervous extracellular matrix is synthesized and released by neurons and glial cells. The role of hyaluronic acid is structural and, together with other molecules, helps to form molecular scaffolds. A layer of extracellular matrix, known as perineuronal net, is found surrounding the membrane of neurons. This layer is composed of hyaluronic acid, tenascin and proteoglycans like chondroitin sulfate (up to 16 types). Perineural nets appear when the nervous tissue stops developing and it is thought that inhibit the cell motility and plasticity, and tissue remodeling. In fact, neuronal plasticity is activated when the perineural nets are damaged or removed. The composition of perineural nets changes during development. Type C chondroition sulfate is abundant in embryonary nervous tissue and gradually, decreases after birth, and disappears in adults, where it is replaced by type A chondroitin sulfate. Blood serum as a type of extracellular matrix is not accepted by everyone, but, here, it is considered as a highly specialized extracellular matrix, containing up to 90 % of water. It is the environment of blood cells. The most abundant protein of blood serum is albumin, which keeps a physiological osmotic pressure between blood vessels and tissues, preventing edemas. Other proteins are γ-immunoglobulins, which are immune system antibodies, α- and β-globulins, which are carriers of elements such as copper and iron. Fibronectins can move between tissues and blood serum. Fibrinogen is essential for blood coagulation. Other blood serum molecules show low molecular weight, and they can be found in the extracellular matrix of other tissues since they can freely cross endothelium.